Everything Chopsticks has just added two new chopsticks featuring illustrated characters of Japan's J-pop culture. J-pop is an abbreviation for Japanese pop music and culture. Now J-pop culture has come to chopsticks. Each chopstick has a cute drawing of a J-pop cartoon character and her accompanying cuddly mate. The first chopstick style features Ami with her little brown teddy bear. The second has Min-Min and her pet panda. Both are colorful illustrations on white pearlescent chopsticks. The chopsticks are 8-3/8 inches long, a length that is typical for women and young adults. Each style is $9.50 per pair. J-pop refers to Western-influenced Japanese popular music with roots in Japanese traditional and folk music. Its popularity has made the music industry in Japan one of the biggest industries in the world, on course to overtake the United States as the world's largest music market. J-pop musicians often tour around Asia, especially China, Taiwan, Thailand, Australia and South Korea, spawning offshoots such as K-pop, Korea's pop music and popular artists such as PSY and his Gangnam Style. J-pop music has become an integral facet of Japanese culture. It is used everywhere including art, anime, fashion, movies and television. The music typically has a frenetic rapid pace which can be difficult for Western people to appreciate. 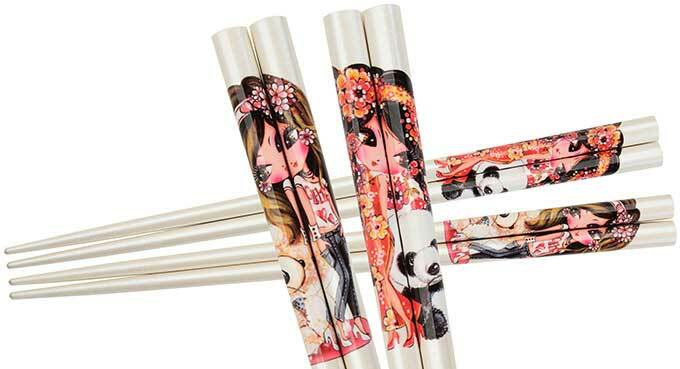 These new J-pop chopsticks embody kawaii (pronounced ka-wa-ee), a Japanese term meaning “cute” and “beautiful”. Cuteness is a highly valued aesthetic quality in Japanese society and pop culture. The chopsticks are available today at EverythingChopsticks.com. Everything Chopsticks features over 400 unique and interesting chopsticks from around the world including artisan chopsticks of Wakasa, Nishijin and Washi, along with luxury Chinese chopsticks and chopsticks from Korea, Thailand, Vietnam and the United States. Everything Chopsticks ( http://EverythingChopsticks.com) has been a leading provider of chopsticks since 2005, specializing in quality chopsticks from Asian cultures around the world.